Manufacturers are always looking for ways to make their production lines more efficient. If you’re a manufacturer and use bulk bags, even if it’s only once in a while, you should evaluate how your facility uses FIBCs and the processes around them. For example, you may have an opportunity to improve your bulk bag filling efficiency. Conitex Sonoco has served the textile and packaging industries for more than three decades. Our goal from the start is to help businesses meet their goals. Here are a few tips on how to improve your bulk bag filling process and in turn, more efficient facility operations. Maximizing the performance of your bulk bags means using a bag that precisely fits your process. Productions run smoother when you are using the correct type of bag. Learn how to choose the right type of FIBC here. FIBCs can be customized from top to bottom. 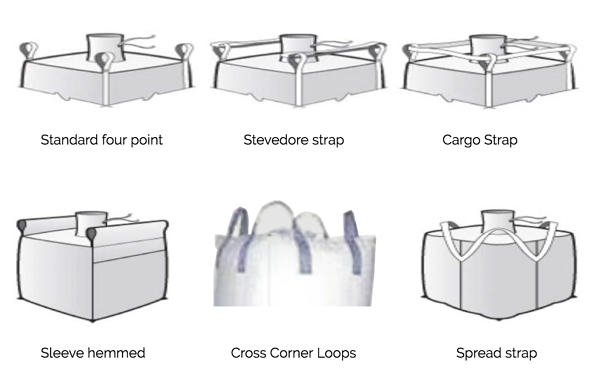 You have options with the fabric, the spout type, the number of loops and how the bottom of the bag is configured for discharge. For the purpose of this article, let’s focus on just the parts of the bag that aide with the filling process. Each type of bag relates to the type of product you are transporting and how you plan on filling the bag. For example, if you need a bag to accommodate dust when it’s being filled, let your manufacturer know. There are solutions specifically for filling dust heavy materials without making a mess in your facility. In this instance, you need a more narrow spout like a standard fill spout or cone spout. If you’re using a shovel instead of a bulk bag filler, there’s a solution just for those needs too. Look for options like the full opening duffel or open top. See examples of these below. What about bulk bag filling equipment? The right type of equipment is just as important as getting the right type of bag. This is all about you understanding your facility’s needs. Find a machine that well suits your plant and space, fits into your process and works with your product. If you have a bulk bag filler, great! Next, you should evaluate how your product is delivered to your bulk bag filler. There are flexible screw conveyors, chain conveyors, aeromechanical conveyors and many other types of conveyors to choose from. A bulk material handling manufacturer should be able to outfit you with the most efficient way to deliver your product to your bags. Efficiency is great, but safety is the most important aspect of the whole filling process. Keep safety at the top of your priority list as you weigh your bulk bag filling options. Let us know if you have any questions about FIBC bulk bags. We have experts all around the world who have seen it all. Conitex Sonoco is happy to help any way we can.